Four forces in the ranks of Khalifa Haftar-controlled Libyan National Army (LNA) were killed Wednesday in a suicide car bombing in the city of Derna where the LNA has been pushing for control. An Islamist militant fighter detonated explosives tucked in a white Chevrolet as he drove by a group of LNA fighters in central Derna, a LNA spokesperson said, according to Reuters. The driver was bearing a white flag, the spokesperson indicated. The LNA has launched a major offensive to take control of the last city, in the eastern part of the country, still posing resistance to Haftar’s forces. The so-called LNA is on the brink of declaring the city liberated after it conquered large parts of city. Few fighters are still resisting. 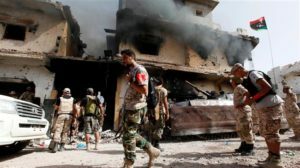 “The main battle is finished and we are fighting pockets (of resistance) in an area of one square kilometer,” Mismari told TV station Libyas Channel. In the takeover campaign, the LNA has imposed since July last year a blockade that has caused a catastrophic humanitarian situation denounced by the United Nations. The around 125,000 people of the city have been caught in the cross-fire opposing the Islamist militants and the LNA. The blockade cut off electricity, water and other staple commodities supplies, according to the UN. The fighting has forced thousands of people to flee the city to neighboring towns and villages. Written by: KanelkaTagba on June 21, 2018. Posted by KanelkaTagba on Jun 21 2018. Filed under Headlines, World News. You can follow any responses to this entry through the RSS 2.0. Both comments and pings are currently closed.